My brother from another mother, on the occasion of his last East Coast dinner before departing for a new job in San Francisco, shared this bottle of 1997 Chateau Le Tetre-Roteboeuf, Saint-Emilion Grand Cru. All eight of us joining in the bittersweet celebration must have enjoyed this gem–an 85% merlot/15% cabernet franc blend. Some fast web research suggests the price tag of this bottle is approximately $150–and that might not accurately represent how delicious it was in the moment. 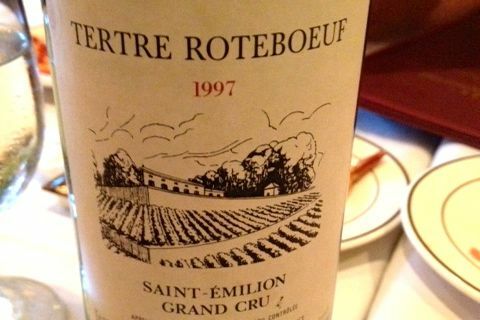 1997 Chateau Le Tertre-Roteboeuf, Saint-Emilion Grand Cru, France. We were in a small family-style Italian restaurant in Chatham, NJ, and had a slew of hors de oeuvres before some good entres. I had a fantastic fish…and while this bordeaux is probably intended for heavier beef and such it has so much substance that it matched up pretty damn well to my special as well. Only shame here is that it was gone far too quickly…much like my friend moving to the West.